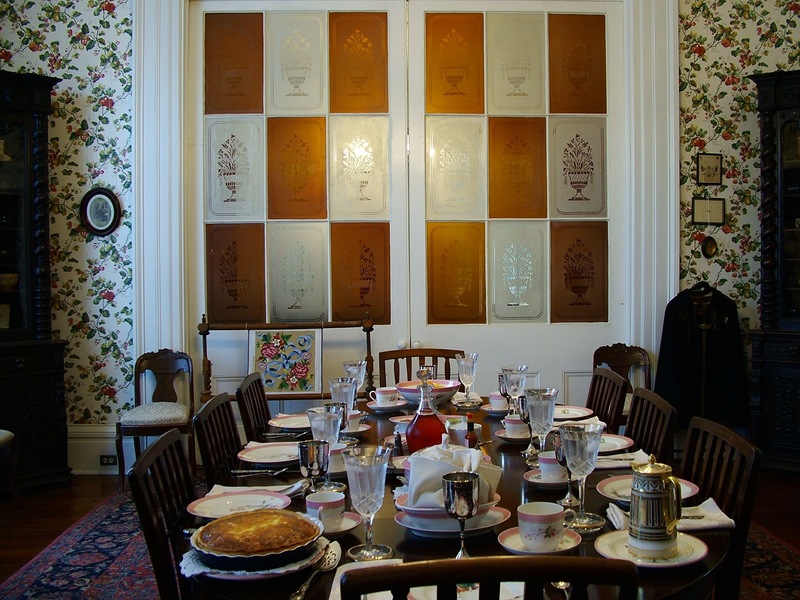 Guests are treated to a hot breakfast each morning served on rare, circa 1875 Haviland china, surrounded by 19th century portraits of early Natchez ancestors of the property owner. This is the only dining room in Natchez that features monumental pocket doors filled with rare etched and stained glass. The amber colored glass was made by adding gold dust to the glass, and the patterns on these original panes were acid etched. 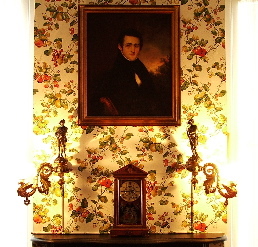 Circa 1840 portrait of Dr. Charles Henry Stone (1806-1864), father of Joseph Newman Stone for whom this bed and breakfast is named. Original gas wall sconces by Cornelius and Baker, Philadelphia. 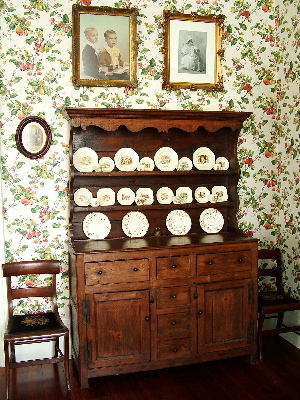 18th century Welsh dresser showcasing antique china. 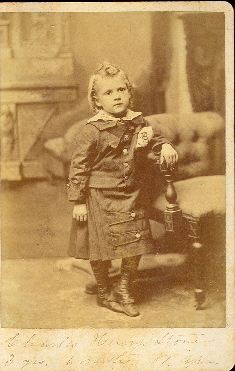 Norman photo of little Charles Stone, died age 13. 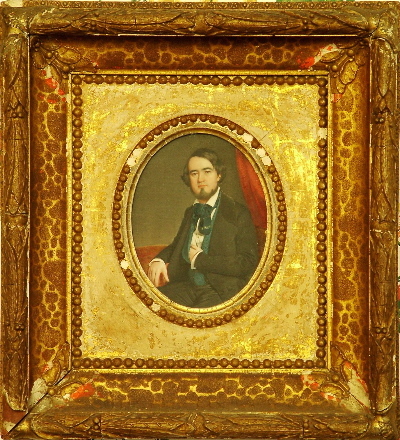 Circa 1840 oil on ivory wall miniature of ancestor John Carmichael Jenkins (1809-1855), builder of Elgin Plantation near Natchez. 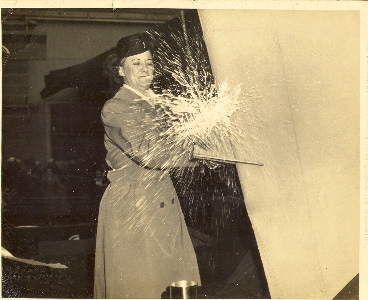 Margaret Graham (Shields) Hendrix (born and died in Natchez MS 1903-1982), great-granddaughter of John C. Jenkins, and great-granddaughter of Thomas Shields, christening the USS Shields at Puget Sound Navy Yard, December, 1944. 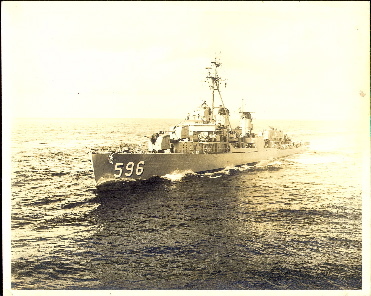 The Fletcher class destroyer number 596 served in the Pacific Theatre late in World War II. 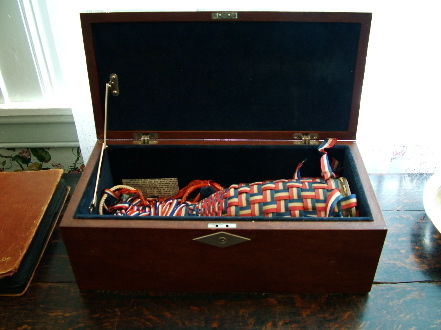 Displayed in this Natchez bed and breakfast Dining Room is the casket holding the champagne bottle decorated in red, white and blue ribbons, used to christen the USS Shields. The USS Shields (DD-596), named for USN Purser Thomas Shields (1783-1827). Contents of this page © 2017 Joseph Britton Stone.